The disc shows a mixture of styles, although it is basically imitating an archaic jade. Unlike archaic examples, it was not carved from a flat disc, but varies greatly in thickness, according to the design. The piece is made of green stone, ranging from a deep grey green to a paler yellowish green, with yellowish-brown patches. 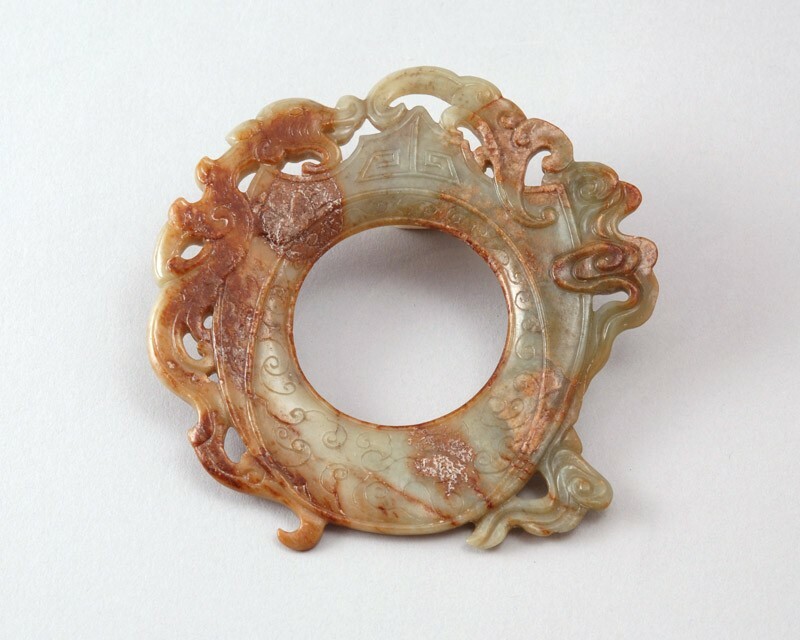 It is carved as an unevenly shaped disc, with a circular hole in the centre and a pointed tip, flanked by an openwork dragon and an openwork cloud motif. On one side, the hole is incorporated off-centre into an oval surround, which slopes towards the hole, where the disc is very thin; on the other side, it is surrounded by a rope-twist border. The surface is decorated with angled and archaistic scroll motifs in relief.